Here in Oregon spring is in the air and with it, excitement for a new workshop season begins to kindle in our hearts. After more than two decades of workshops we already know that we will be inspired and humbled by those who come to join us and that together there will be a synergy as we work towards positive change in the world. We know that we will make important and deep new friendships. 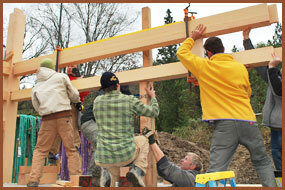 We know that, some students will discover a love of natural building that will be life-long. We know that we will meet young families and help them to travel one step closer towards their dream of creating healthy and ecological dwelling of their own. Professional builders will join us and some will leave fully trained in the EcoNest family of techniques prepared to make them available somewhere new. We know that we are going to have fun, laugh a lot, learn a lot. We hope you can join us this year!…We look forward to meeting you! Sign up before March 15th and receive 50-% off regular workshop price for a companion. Exciting developments for EcoNest in Costa Rica. 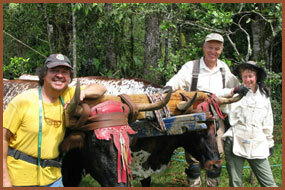 Read more about our winter project on an ecological reserve in Costa Rica and view our slide show. This winter we had the opportunity to work on a prototype for natural housing combining bamboo and waddle and daub. We had the pleasure of working with, and learning from, master Costa Rican Bamboo expert Martin Coto . 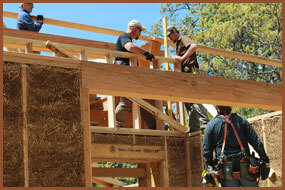 Click here to see a slide show about the prototype building we created. We have a vision of offering winter workshops in this sunny and eco-friendly country in the near future. If you have an interest in keeping informed about this development give us a call and we will put you on our Costa Rica contact list.541.488.9508 Pura vida! Professional Builders we need you! Coming next month. We will be unveiling our newest EcoNest Stock Plan Series. In keeping with the times we will be launching our most affordable stock plan series ever. These plans will be available to future EcoNest Owners through our Affiliates.